Dating back to the 15th century, Azulene is an essential oil derived from chamomile flowers which is incredibly soothing to irritated or delicate skin. The products in the Azulene line combine this powerful ingredient along with other nourishing herbal extracts to offer gentle and calming treatment for all skin types, especially sensitive skin. A nourishing, soothing and moisturizing creamy cleanser made with sweet Almond Oil and pure Azulene. Designed for all skin types, especially sensitive. Gel mask that is especially soothing, cooling and moisturizing for sensitive, inflamed and irritated skin. Apply a thin layer and leave on for approximately 20 minutes. Rinse thoroughly with lukewarm water. A refreshing, balancing toner that gently restores the skin and calms inflammation. Rich in azulene and lavender oil, this toner is effective at cleansing and soothing delicate and irritated skin. After cleansing, while still slightly damp, apply a small amount to a cotton pad and wipe over face and neck area. May be used with or without preceding cleanser. Soothing day cream with herbal extracts and essential oil of Chamomile. Has a mild SPF 3. Cools, calms and nourishes all skin types, especially sensitive and irritated skin. Mornings and evenings, apply a thin layer to face and neck after thoroughly cleansing. Rich facial and body massage moisturizer with the addition of essential oil of Chamomile. Designed to nourish, moisturize and soothe the skin. Not recommended for oily/combination skin. Gentle, soothing massage oil for the face and body. 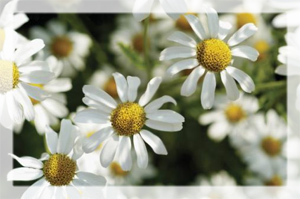 Includes a high concentration of chamomile essential oil to cool and calm delicate skin. Not recommended for oily/combination skin.